A large amount of literature has been developed on the so-called “Resource Curse” hypothesis, which suggests that natural resource abundant countries tend to have slower growth rates than resource-poor countries (Sachs and Warner 1997, 2001). However, another branch of the literature rejects this theory and proposes that the long-run relationship between these variables is ambiguous, since it actually depends on institutional quality (Mehlum et al 2006; Tornell and Lane 1999). This line of thought argues that institutions could encourage private agents to deviate their inputs to unproductive rent-seeking activities, which might counteract the contribution of resource rents if the institutional framework is not strong enough. We should expect this appropriation process to be particularly relevant for mining commodities during the 2000’s boom, as they have been pointed out as the most susceptible to rent-seeking issues (Boschini et al 2007, 2012). This point, in addition to the fact that mining commodities seem to be the most affected product group by China’s demand shifts, which was one of the main factors stimulating the 2000’s commodity boom (Jenkins, 2011), make mining countries a particularly interesting case of study. The graph points out the countries that should have been the most affected by the commodity boom, and allow us to anticipate how their economic growth was impacted during the period by taking the paper’s hypothesis as the starting point. 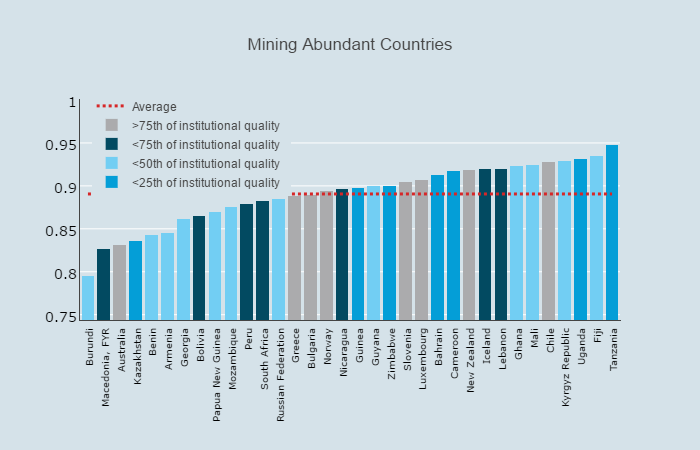 We should expect a negative effect from mining revenues for the countries located on the right side of the graph that also had a dark color tone, that is, countries with high concentration levels that also have weak institutions such as Tanzania. On the other hand, we should expect a positive and relevant effect for a country like Australia, which is also a natural resource abundant country but has lower concentration levels and strong institutions. A country with strong institutions but with a high level of concentration such as Chile, is likely to have a less significant effect from mining revenues. These are all examples of countries that that mainly rely on mining commodities (iron, copper and gold) and that have China as one of their most important exports destinations, so they are greatly exposed to Chinese demand’s shifts. 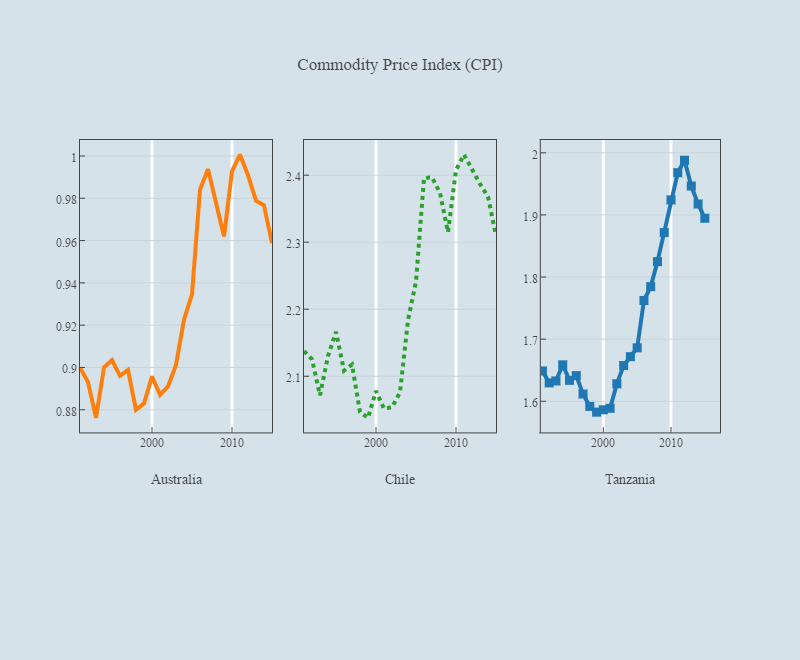 The following graph presents the evolution of these three countries’ commodity price index (CPI) from 1991 to 2015. The magnitude of the 2000’s commodity super-cycle seems clear, as they show a notorious increase in their mining CPI between 2001 and 2011. Using the results from the system-GMM estimations of Larraín and Perelló (2017), we are able to compute the marginal effect of mining rents on economic growth given the country’s concentration level and institutional framework at the beginning of the “boom” period. The marginal effect corresponds to the impact on economic growth from a 1 percentage point increase in the CPI, but we can also compute the overall effect of the boom period, by quantifying the magnitude of the CPI’s change from 2001 to 2011 for each country. The following table briefly presents the results of these estimations. The table shows that the marginal effect of mining revenues is positive for Chile and Australia, but considerably larger for the latter. This means that Australia, a country with a more diversified mining sector, can take better advantage from each percentage point increase in its mining rents. The fact that the boom was stronger for Chile, allowed this country to have a similar coefficient for the overall boom’s period, however, this effect is not statistically significant. On the other hand, the story gets uglier when looking at the case of Tanzania. This country faced an important increase in its CPI during de boom, but these additional revenues had a negative effect on growth. The magnitude of this negative effect is even bigger than the positive effect experienced by Australia. This is due to Tanzania’s high level of concentration and its institutional weakness, a combination that, far from avoiding rent-seeking activities, encourages rent appropriation by private agents. These results show how the shift in mining prices during the 2000’s boom promoted growth for countries that were able to appropriately manage the extra-revenues, while others have faced the commonly-called Resource Curse because of rent-seeking effects. This fact is reflected on the different impacts the last commodity super-cycle had over Australia, Chile and Tanzania. Moreover, the evidence suggests that the unfortunate reality of Tanzania is replicated in other African countries as Uganda, Cameroon, Zimbabwe and Guinea, which also have high within-sector concentration levels and extremely weak institutions. This is a very worrying issue, as these countries heavily rely on their mining resources to improve their poor economic development. After analyzing previous and most recent investigations on the topic, we highlight the importance of encouraging these countries to (a) improve their institutional regulations and (b) make efforts to diversify mining production. These are extremely hard tasks, but at the same time, crucial in order for them to take advantage of extra-revenues from mining resources. Publicado inicialmente en el blog El Faro: un mundo de ideas, el 9 de Abril, 2017.